It's been some time since I featured any new hair care bits, mainly because hair care isn't a topic that goes down all that great with you guys but it's an area of beauty that I absolutely love, and is an area of beauty that I still want to cover. I thought i'd strip it back slightly, rather than bombarding you with load of new products and instead focus on a select few products that I've been loving from Vatika recently, as they are an amazingly affordable brand that doesn't get spoken about a great deal in the blogging world. Vatika is a brand that I met through a blogging event, of whom i'd never really heard of before but soon recognised their products from their packaging as it is quite stand out in comparison to your typical haircare brands. Vatika is a brand that not only cover hair care, but also hair dyes and skincare all of which are totally 100% natural, and in attempt to take my haircare in the more organic route (due to overuse of sulphates reacting with my coloured hair) I just knew I had to try out some of their products! The lovely team at Vatika kindly offered to send me a few of their products to try out and they were so personal to me, and my hairs needs that they selected a few products from their wide range of hair care products to try out, and my hair has not felt as healthy as it does now in a very long time, years in fact! As my hair is very prone to at home dying kits, it has lost a lot of it's natural shine but is also quite dry and brittle through the years of dying, so the Vatika Virgin Olive Nourishing Shampoo* (£2.19) sounded like the perfect shampoo to give my hair the cleanse that it needs from the build up of product, but to also nourish and to stop my hair drying frizzy, which always leaves it feeling cleansed but also so soft. What I personally enjoy about this shampoo is that the formula is quite light, but goes a really long way as i've been using this on and off for a good few months and i've still got a good half of the bottle left. It has a very mild fragrance and is probably the first shampoo in a good few years that doesn't sting my eyes, which isn't usually a selling point to a product but it's definitely a bonus for me! 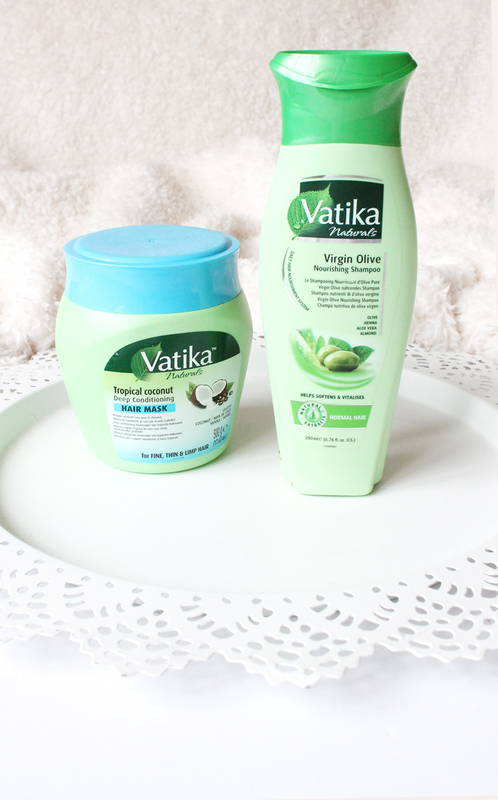 The second part to this hair combo is the Vatika Coconut Hair Mask* (£5.99), which is a part of their coconut range specifically aimed at fine or limp hair, which sums up my hair perfectly! I absolutely love using a wide variety of hair masks, as I find my hair often gets used to products if I use them too regularly and this mask is a lovely once a week treatment that my hair absolutely adores! Similarly to the shampoo, the formula to this mask is actually really lightweight as I find a large proportion of hair masks are actually quite weighing on my hair, but this is so lovely. I typically slather this all over my hair, including the root area as every once in a while it's good to give your newest hair some TLC. Leaving this on for around 10 minutes to allow it to works it magic, and then rinsing off just leaves my hair feeling so soft but also completely knot free, which means combing through my hair is an absolute dream! If you're wanting to switch up the hair products you're using, or you're wanting to try out some more natural haircare products then i'd totally recommend checking out Vatika's amazing range of products, as they have so many products aimed at so many different hair types, or hair needs. Their prodcuts are also very widely available in most Asda and Superdrug stores, so they're easy to get your hands on!